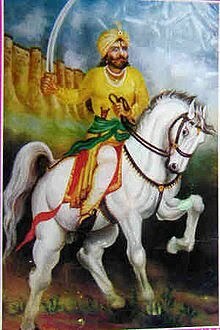 Maharaja Bhim Singh Rana (1707–1756) was the most powerful ruler of princely state Gohad in northwestern Madhya Pradesh, India. Singhandev was the founder of Gohad state. Later it developed into an important Jat State. The Jat rulers of Gohad were awarded the title of Rana. Maharaja Bhim Singh Rana played an important role in keeping a power balance in Malwa. The Delhi Mughal ruler sent Jay Singh of Jaipur as satrap of Malwa in 1729. Malharrao Holkar, Udaji Panwar and Kanthaji Panwar encountered Jay Singh at the Mandavgarh fort. Jay Singh succeeded in defeating the Marathas, with the help of Maharaja Suraj Mal of Bharatpur state. Maharaja Bhim Singh Rana helped Suraj Mal in this mission. This alliance made them the enemies of the Marathas.